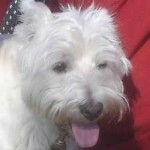 Years ago, when we were still doing referrals rather than fostering, Scruffy was in another Rescue. A couple of puppies were dumped in a shelter by a puppy mill. A lady “rescued” them and then asked us to help find them homes. We sent a couple to see them and they adopted SCRUFFY. 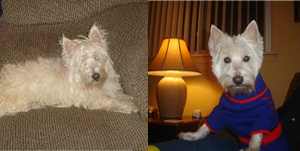 Now, about 8 years later, Scruffy is back in rescue. 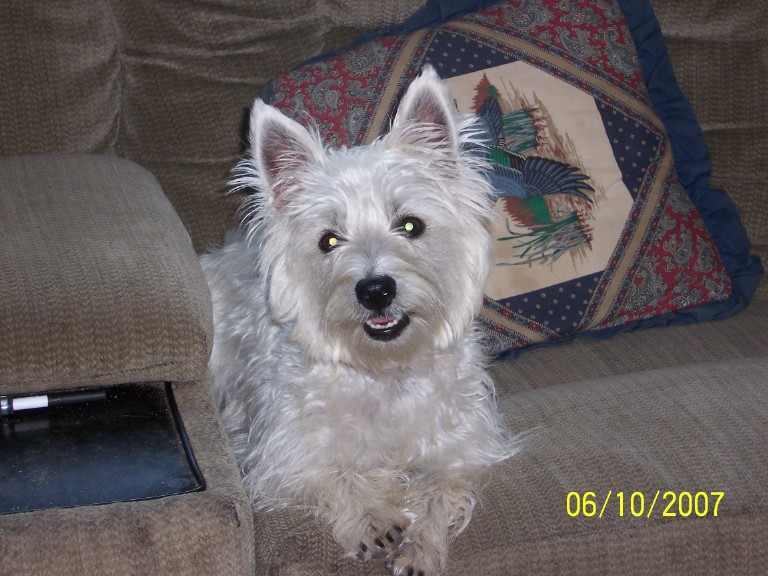 He was doing great and considered a wonderful dog but they had a child after they got Scuffy. The six-year-old insisted on hugging Scruffy when he was trying to sleep. 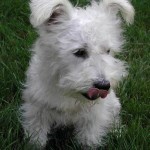 After the 2nd incident, even though they knew it was the child’s fault, Scruffy lost his happy home. 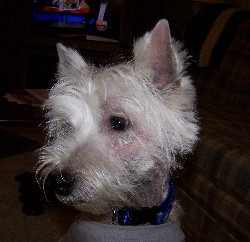 Scruffy found his “Forever” home and doing fine. Five-year-old BRUNO needed a new home when his family’s living arrangement changed. His Dad was going back to his original country and his mom was working two jobs. Bruno was living in a crate and his mom and dad knew that wasn’t fair to him. He had not been neutered but he was healthy. So after getting his medical updated, he soon was ready for placement. His new dad has all kinds of time for Bruno. Bruno goes pretty much everywhere his dad goes and is living a very interesting life. 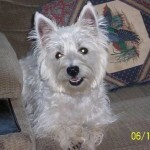 BONNIE age 6, was taken from an Ohio puppymill. She was given to a friend, and after a few months they decided they had too many dogs. 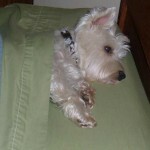 Bonnie had been “depressed” and they decided it was probably a false pregnancy. They surrendered her to Rescue. She had clearly had some litters in the past. To be sure that doesn’t happen again, we always spay or neuter the dog before placing them. 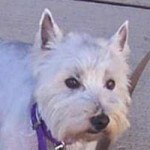 Bonnie was spayed and during the procedure, the vet found a uterine infection. This accounted for her “depression”! This sort of infection is fatal if the dog is not spayed immediately fortunately, we got her when we did. 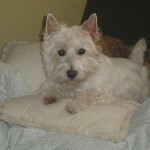 Bonnie is a permanent member of her foster home. 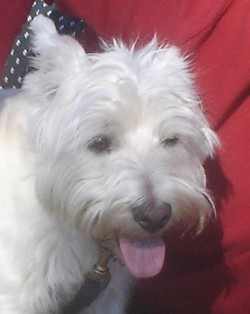 FRED also five, was surrendered by a family with a young child and a new baby. He wasn’t doing well with the older child and they were concerned that it would be an even bigger problem when the baby became a toddler. So Fred went into foster care. After his medical was taken care of, he also found a new home with a dad who has plenty of time for him. SPARTY’S family had problems with his habit of lifting his leg. They talked to a behaviorist but felt that their teenagers would not provide the consistency needed to retrain him. 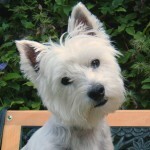 Their busy family life was a bit too much for Sparty and they felt he would do better in a quieter home. In foster care we worked on housebreaking but our biggest effort was on socializing him. He had a hard time with men coming into the home, especially boys with baseball caps! He has been adopted and is doing well. MAGGIE age 11 months, was left at a shelter by her family. They said they were unable to housebreak her. 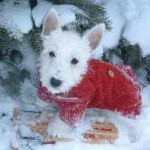 When she arrived in foster care, she quickly picked up on the housebreaking. Her foster mom worked with her to overcome an extreme shyness and noise sensitivity. 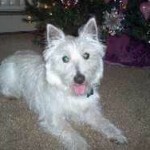 Maggie has been adopted continues her recovery. LOUIE is very clearly a dog who was well loved. He is mild mannered, eager to please and happy. He would like a home where there is plenty of time for him. He loves to go on car rides and was probably taken along on errands in the past. 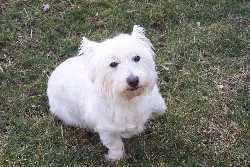 Louie is a large-built Westie and came in considerably overweight. The vet estimated a good weight for him to be 24# and he has made some progress in that direction but, at 28#, still needs help in that area. 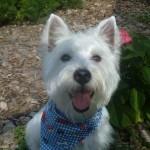 His adopters have a wonderful boy and a great addition to their home. He is good with both people and other dogs. 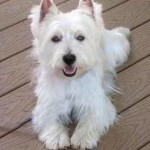 Louie has found a good home with folks who have lots of time to enjoy his company. CAREBEAR was 1 year old when she came into Rescue. She lived her first six months in a cage in a puppy mill. Then she went to a lady who intended to use her for breeding. 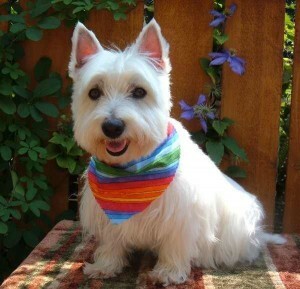 However, after she lived through the trials of a “heat”, she decided she really wasn’t cut out to be a breeder. She sent CareBear to Rescue as she came near to another heat. She was transported to a foster home on the other side of the state where they had room for her. This is often accomplished by having several people volunteer to drive legs of the trip. 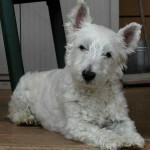 CareBear arrived in her foster home and was quickly whisked to the vet to be spayed. 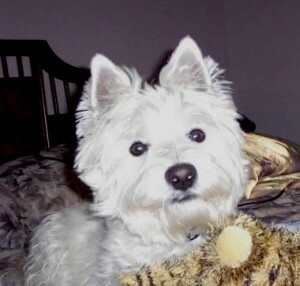 Once this was completed, and we had time to understand her personality, we were able to easily place her in a home who had adopted another Westie a year or so ago. Now they have two who are able to play together. 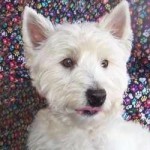 They have quickly bonded and CareBear is a very happy little girl living a normal life of a loved pet. She is now named Katie. TIGER arrived after being turned in to a shelter. They said he wasn’t doing well with children. He arrived there stuffed into a tiny cat carrier and protesting loudly. However once out of the carrier, he settled down and became a very nice little boy. In his foster home, it was noticed that he seemed to be favoring one leg. The xrays revealed no obvious reason so he was sent home to rest the leg for a while thinking it may be just a soft tissue injury. (Maybe why he didn’t like the children?) At 2 years of age, this is a very sweet and gentle little boy. We have found that we must work a bit on his crate reactions in that he doesn’t like to be approached in the crate when he can’t identify the person approaching. At day care, he tends to nip the big dogs ankles and run away. 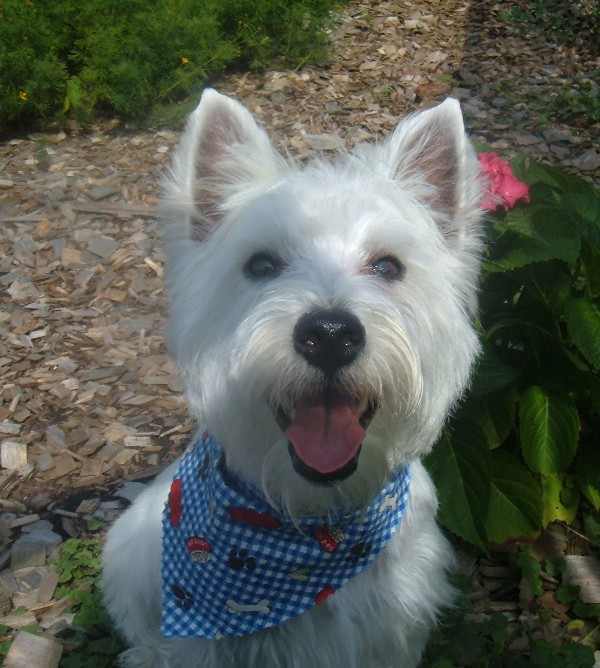 He is working with a behaviorist to correct some of his issues and has now been adopted. 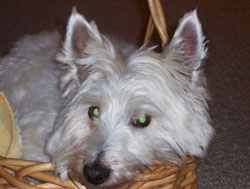 Four-year-old PENNY came to us from a home with twin two-year-old boys. Penny has done nothing more than raise her lip to them when they disturbed her rest but the family, in an attempt to not let problems escalate, decided to keep her and the boys separate. This meant that Penny could not be with Mom nearly as often as she wanted. Since she has been the ‘baby’ before the boys came along, she found this isolation very difficult. Mom and Dad decided that she should have a chance at a better life than she was currently living so surrendered her in hopes she would find a home where she would have much more attention. Penny has now been adopted and has a home with two other Westie girls who have become her best friends and playmates. BUDDY was adopted from a shelter by a man who enjoyed traveling. It turned out that Buddy didn’t share his enjoyment. 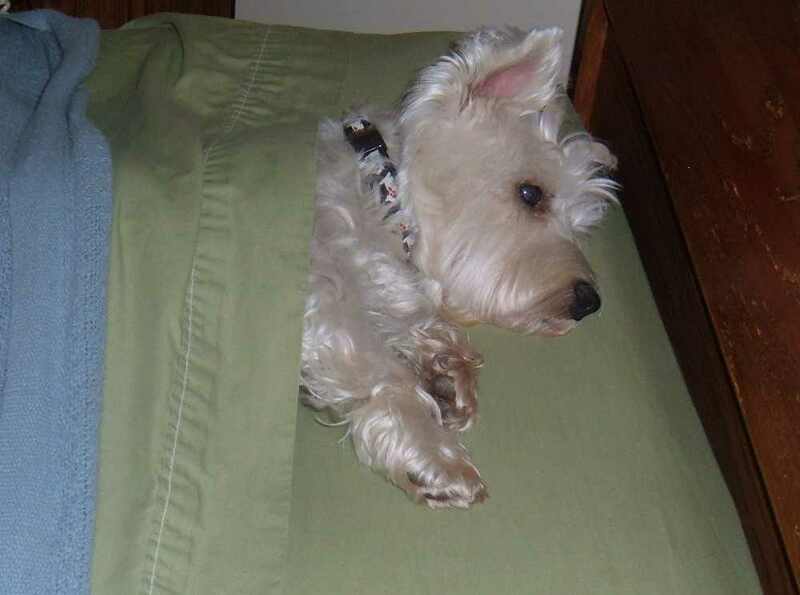 He was too active and tended to bark at noises he heard while staying in motels. So three-year-old Buddy came in to foster care. Buddy has now been placed and is doing well. CLEO’S (age 6) mom had back surgery and was no longer able to care for her. Cleo was left at the Detroit Humane Society shelter and stayed there for six weeks. At the end of that time, they contacted us and we took her in. Cleo is a sweet little girl with the biggest eyes ever! And they are rimmed in black so she kind of looks a lot like a doggie version of Cleopatra! She does produce more than average amount of oil which means she needs extra baths. Corn starch brushed into her coat does a good job of getting her from one bath to the next. Cleo has had to move around a lot even since being in rescue due to a lack of available foster homes. She prefers to go outside on leash. When upset, she tends to growl and hide. We are trying to make her feel more secure. 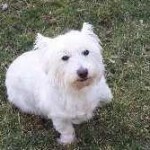 Cleo needs a home where there are no children but she is fine with other dogs. She does need a quiet home without a lot of commotion or changes in routine. She would like a home where someone had time to snuggle and love her and introduce her to new things slowly. She is a good girl but does have a growl. 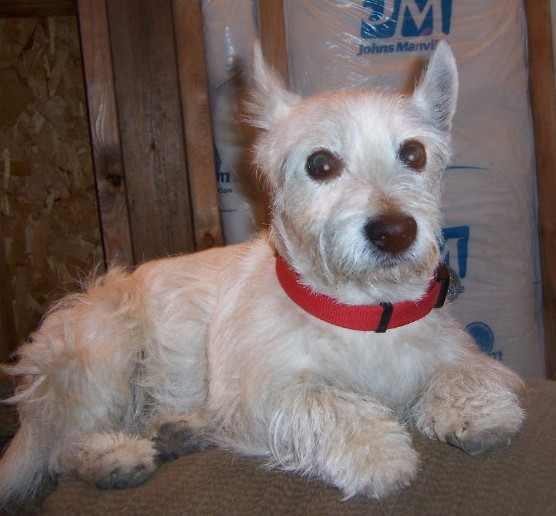 She needs a home who can give her structure and love and not be intimidated by her. November: Cleo has been adopted and is doing just fine in her new home. GRIFFIN approx. 2-year-old was adopted from a shelter in Western Michigan but turned over to Rescue shortly thereafter. He has kennel cough and flea allergies. 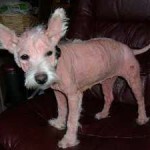 Since he was covered in fleas when he was adopted, he has been pretty miserable and has lost significant hair. Fortunately flea allergies are fairly easily fixed. Once he was feeling better he was neutered and had a dental. 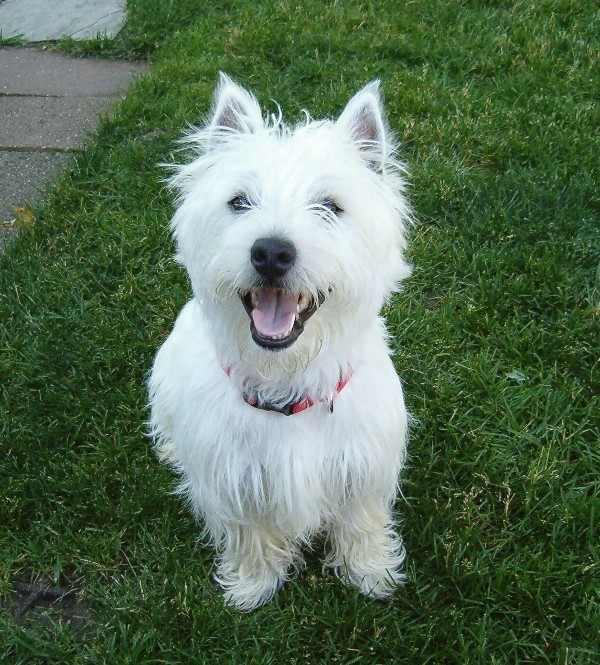 This is a happy, active little guy who is enjoying wrestling and Westie play with his foster sibling. 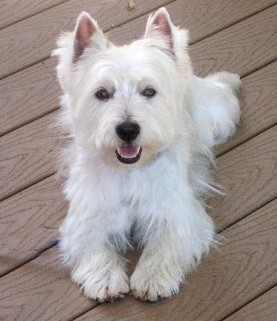 He was listed as a Westie Mix but if he is a mix, the Westie side predominates. Griffin is now in a new home and appears to have become the center of the family. 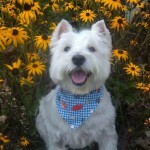 TUCKER came to us at age 5 with skin issues that had kept him in a “funnel” collar for the past year. The owners had spent a lot of money but were unable to find a cure for this. They finally gave up and surrendered him to us. We took him to Dr. Theodoroff at Animal Medical Center where he was given a dental and while he was under the hair around his mouth was shaved off so they could give the area a good, much needed cleaning. After the cleaning, he showed no signs of any allergies. His mouth area has remained clean and does not seem to bother him at all. Tucker is a friendly guy who obviously had some good breeding. 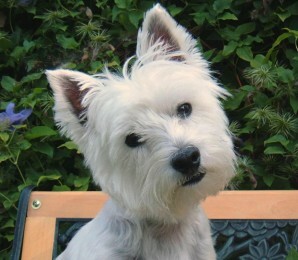 Tucker, like most Westies, likes to bark but even that has reduced to very minimal. He gets along well with the other dogs in the home but often goes off on his own too. He is so grateful for every pet or cuddle! He began to drink water heavily and tests show that he has developed diabetes. This is likely due to the fact that he was on so many steroids for so long during his lifetime. At this point iwe are starting regulating his insulin. We expect to control it fairly easily with a small amount of insulin required. Tucker is a charming little boy who would love to have someone to dote upon him. A home where a human is a diabetic might be a wonderful match. Tucker has decided he wants to sleep in the bed instead of the crate. He tries every time we go into the bedroom, to climb into the bed but he doesn’t fuss when he is redirected to the crate. Note: His foster home made the mistake of asking another Club member to babysit one weekend and they asked if they could keep him while he is in foster care. This boy just grows on you! He would love a home with a “daddy”. 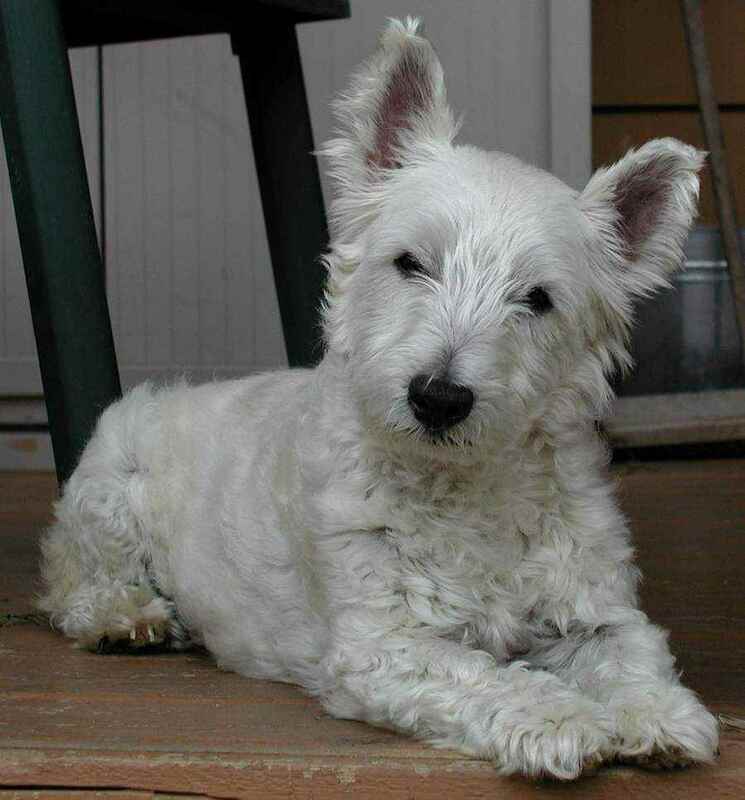 NOVEMBER 2007 – Tucker has been adopted by a family who previously had a diabetic dog and know all about caring for a boy with diabetes. 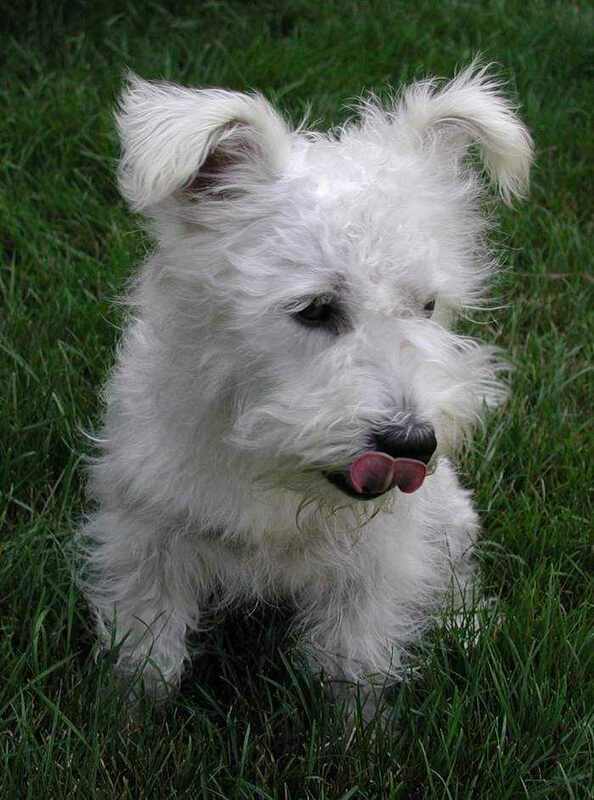 He now has two Scottie siblings to play with too. PARKER was a stray, approximately 3 years old. He arrived with kennel cough and fleas. We soon realized that he was not doing well and went through testing. 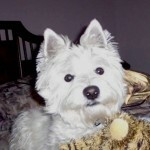 We learned that he is hypothyroid and was started on medication which has corrected the problem. This involves one small, inexpensive thyroid pill a day for life. 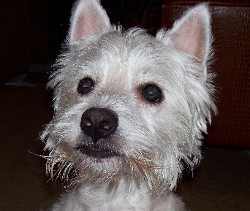 NOVEMBER 2007 – Parker has now been adopted. He and mom are thrilled to have found each other. MAC was turned in to a shelter because he was not doing well with the neighbor children. He was good with the children he lived with but was overly protective. 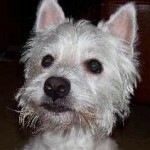 Mac is a very sweet litle boy who has tons of energy to burn off. He loves to run in the yard and play with the other dogs. Mac is a bit timid. His foster mom has to carry him from his crate to the door to avoid an ‘accident’ but he is basically housetrained. Like most at this age, he can still use housetraining reinforcement. Mac is very small and thin, about 13#. He loves to be petted and cuddled. He sleeps through the night in his crate with no fussing. He was adopted and learning to live with a cat. 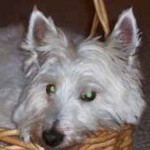 BELLE came in to Rescue at age 18 months because her family did not have time for her. They were also expecting a child so Belle needed to find a new home. She is a very nice but rather shy little girl. She finds it hard to adjust to new situations but when she does, she is a delightful little girl. 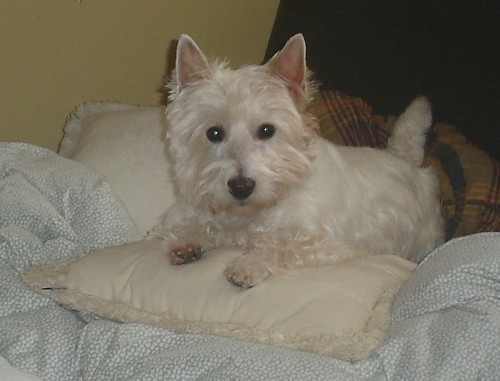 Belle was adopted by a family who has adopted from us in the past. She will be a snowbird, living in Florida in the winter! She has been renamed “Maggie Mae”. 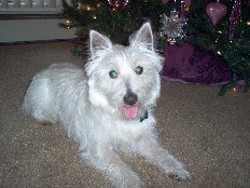 SASSY came into Rescue way back in 2001 and was placed in 2002. Towards the end of the year 2007, her owner passed. The family contacted Rescue and asked if we would adopt Sassy to another lady who they had found who not only wanted her but was already caring for her. We did a homecheck and approved the adoption. Sassy’s life has continued with as little interruption as possible. We hope all adopters will make sure their family knows that Rescue must be involved in any future placements of adopted dogs. If the family does not have a place for the dog to go, Rescue will take the dog and find a new home. 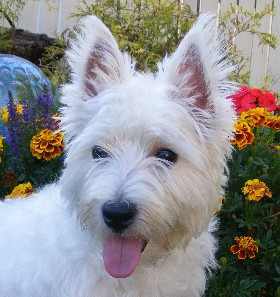 If the family does have an adopter in mind, Rescue will simply check to be sure the home is appropriate for a Westie and will then approve the new adoption. 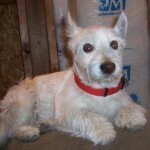 LUCY’S owners lost their aged Westie and decided to get a puppy. They went to a petstore/puppy mill in Ohio and bought two puppies. 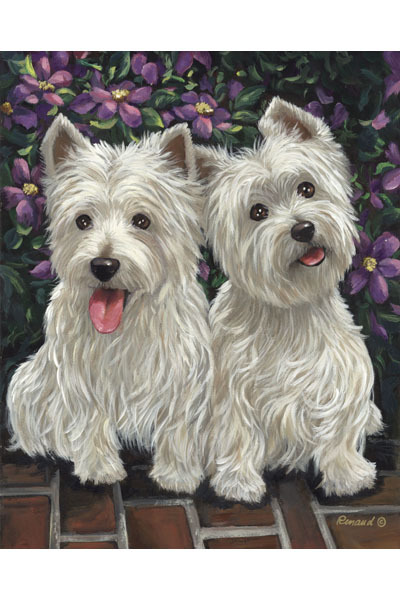 When they got home, they realized that they had forgotten just how active puppies are and how much work they are. One of their children took one of the puppies and the other puppy came in to Rescue. Lucy is a little charmer. She was spayed and after Christmas she was placed wtih another family who had just lost their previously rescued Westie after a surgery. Lucy has been helping to fill a hole in their heart. MAX is a year old. His owners found him to be very difficult to house break and they also were finding him to be financially too much for them to handle. Max came into foster care before Christmas. He had no housebreaking issues once he had a yard instead of a tieout. He is a happy boy who quickly found a home where he is the center of attention. One-year-old RAMSEY’S was found as a stray and taken to a shelter. The shelter found the owner who came in to claim him but ended up surrendering him instead because he wasn’t doing well with the toddler in the home. He came to Rescue just before Christmas. 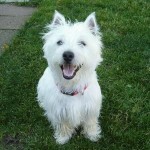 He has been adopted and has a new Westie brother to play with! RICKEY’S mom contacted us just before Christmas. 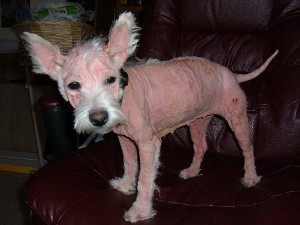 Rickey (age almost 2) had a skin/allergy issue which has caused him to lose much of his hair and be pretty miserable. She had lost her job and could not afford medical care for this boy. She didn’t want to give him up but knew that he needed more help than she could provide. Rickey remains in care as we treat his skin issues.